^ a b 日本寄生虫学会用語委員会 「暫定新寄生虫和名表」 2008年5月22日 Archived 2011年4月14日, at the Wayback Machine. ^ Levine ND (1977). 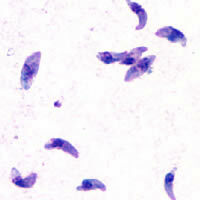 “Taxonomy of Toxoplasma”. J. Protozool. 24 (1): 36-41. doi:10.1111/j.1550-7408.1977.tb05278.x. https://onlinelibrary.wiley.com/doi/abs/10.1111/j.1550-7408.1977.tb05278.x. ^ Ogedengbe et al. (2016). “Molecular phylogenetic analyses of tissue coccidia (sarcocystidae; apicomplexa) based on nuclear 18s RDNA and mitochondrial COI sequences confirms the paraphyly of the genus Hammondia”. Parasitology Open 2: e2. doi:10.1017/pao.2015.7. ^ Prowazek (1910). “Parasitische Protozoen auf Japan, gesammelt von Herrn Dr. Mine in Fukuoka”. Archiv Schiffs-Hyg. 14 (10): 297-302. https://archive.org/details/archivfurschiffs1419unse.